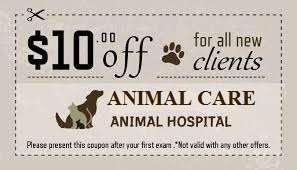 Make your appointment today and don't forget to print and bring in your $10 off coupon! Pets are GREAT! These special family members give us joy with their antics, companionship through all stages of our lives, and unspoken trust and loyalty. The support of these unique relationships is a responsibility we accept gladly. The Animal Care Center and Pet House Suites were created to ensure that you have a source for all of your pet's needs. Whether it be exceptional health care including Wellness Checkups, Digital X-ray, Laser Therapy, Dental Services, Surgery, or a luxury resort where your special friend can enjoy their own vacation while you are away, you will find it all at our modern facilities. If you're looking for a home away from home, a professional grooming or bath for your furry friend, letting them have fun at doggy daycare, or purchasing select diets and other pet products, look no further than Animal Care Center and Pet House Suites. We are happy to help with anything you need- just ask a member of our knowledgeable and caring staff. Our website is full of valuable information about our wide range of services; advice for maintaining your pet’s health; and even a complete Pet Care Library with detailed resources about animals and their care. On this site you also will find specifics about our facilities, including office hours, driving directions, new client information, appointment scheduling and an introduction to our highly trained staff. Giving your pet the best possible care is our first priority. We hope you will contact us at our Animal Care Center with questions, or to schedule an appointment. Thank you for visiting our site! At Animal Care Center & Pet House Suites, we treat your pets like the valued family members they are. Dr. Thomas Roehr has been the director of the Animal Care Center since 1995 and its primary veterinarian since 2001. After earning an undergraduate degree in biology from Virginia Tech, Dr. Roehr went on to graduate from the University of Georgia College of Veterinary Medicine in 1973. Dr. Constance Houk was born in Winchester, and has been a lifelong resident of Virginia. She attended the University of Virginia and is a graduate of the University of Georgia earning an undergraduate BS degree in Agriculture. "We wanted to thank you for all of your attention, patience, and kindness when Duke was unexpectedly sick. He was a wonderful friend and a part of our family that we will never forget. Your clinic helped us so much that day and that kindness is appreciated more than words can express. Thank you." "Loved the comment the Dr. made about 'Marble' being wonderful to work with, THANK YOU for taking GOOD care of her ." "Thank you all for taking such good care of our shelties Brandon and Maxey Joe. Going out of town is a little easier when we know their doctor and his staff are close by. Etta and the ladies at Pet House Suites are so good to them when they are there." "We just wanted to thank you for all the love and care you gave to all our animals these past few years."